A new scientific study using satellite technology provides clear evidence that California’s tough clean air programs are working to reduce emissions of fine particle pollution throughout the state. Scientists from the Rollins School of Public Health at Emory University, NASA’s Jet Propulsion Laboratory and the California Air Resources Board (CARB) worked together to analyze satellite data to determine the 15-year trend of fine particle pollution. This type of pollution is also known as PM2.5, referring to particulate matter that is less than 2.5 microns in diameter, about 3/100ths the diameter of a human hair. PM2.5 is especially burdensome in California and accounts for the greatest percentage of health impacts attributable to air pollution. The study, which focused on the four major components of PM2.5, was recently published in the journal “Atmospheric Environment”. This is the first study to evaluate long-term changes in major PM2.5 components using spatially comprehensive satellite data. The data were collected using a unique type of instrument — the Multi-angle Imaging SpectroRadiometer (MISR) — on NASA’s Terra satellite, which complements air quality data collected at existing air quality monitors on the ground. Most monitors do not track individual PM2.5 components, and monitors are mainly placed in urban areas where traffic is heaviest and more people live, not in rural areas. 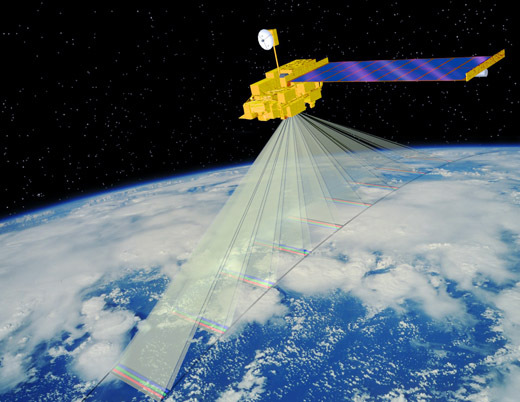 The satellite technology fills spatial and temporal gaps in air quality data. This study demonstrates the success of California’s air pollution control programs, regulations, enforcement efforts and clean-air plans in regions with the greatest air quality challenges: Southern California and the southern Central Valley. Satellite data was able to identify locations that could be directly linked to programs that reduced measured pollutants. Coastal Cities: Concentrations of sulfates in coastal cities decreased significantly, the result of CARB’s 2006 ultra-low sulfur diesel fuel standard, 2007 Drayage Truck Rule, and 2008 Ocean-Going Vessel Fuel Regulation. Transportation Corridors in Los Angeles: Concentrations of nitrates in the Los Angeles area decreased significantly, most prominently near transportation corridors, pointing to the success of CARB’s various mobile source NOx control programs. Urban and Suburban Southern California: Concentrations of organic carbon (OC) and elemental carbon (EC) decreased significantly in both the urban and suburban areas of Southern California. This is the result of CARB’s programs that clean up cars and trucks, along with other programs including wood burning rules implemented by air districts. In the future, satellite remote sensing technology can be used to identify air pollution “hotspots” of major components of fine particle pollution, and help inform air quality management strategies and public health surveillance programs. Satellite data also can complement ground monitoring efforts to inform CARB’s Community Air Protection Program to identify environmental justice issues that can guide future control programs and mitigation strategies to improve air quality in California.